The Boston Globe called her “the queen of bean cuisine,” while the Chicago Tribune described her as “an earthy, red-headed, yarn-spinning woman.” The exuberant Crescent Dragonwagon (yes, that is her real name) is as full of contradictions, as she is wonderful. Her thoughtful recipes range from deliciously pleasurable to healthy and nutritious. Dragonwagon, who sometimes calls herself a Southern Yankee, was born in Manhattan to a Virginian mother and lived for 33 years in the Ozark Mountain community of Eureka Springs, Arkansas. There, she ran an acclaimed country inn and restaurant, Dairy Hollow House, with her late husband, Ned Shank. She called the inn’s style of cuisine “Nouveau’Zarks”, and celebrated local ingredients back in the early ‘80’s, an outlier on what has come to be called the farm-to-table movement. The James Beard Award-winning cookbook author (for the book Passionate Vegetarian) has appeared on the Today Show and Good Morning America. She works in many genres; she’s also published dozens of children’s books, two novels, and hundreds of magazine articles for publications ranging from Bon Appetit and Fine Cooking to Cosmopolitan and the New York Times Book Review. Her Bean by Bean cookbook (Workman Publishing) is a cornucopia of more than 175 bean recipes — including soups, salads, chilis, stews, casseroles and curries and hashes, side-dishes and mains, even desserts. Some of Crescent’s recipes are traditional, some brand-new, but almost all have a twist or kick that reinvents and deepens flavors, allowing old favorites to be rediscovered. Crescent does just that. 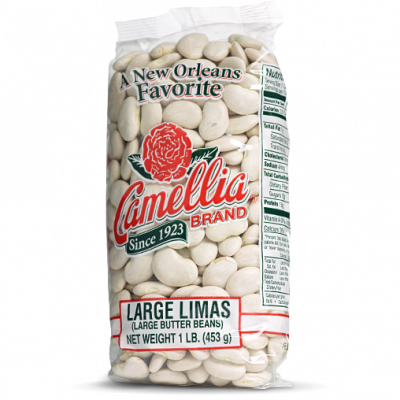 And Camellia brand is excited to feature her take on lima beans in several irresistible recipes from her Bean by Bean cookbook: a traditional Brunswick Stew, a creamy, comforting, down-home Southern Country-Style Butter Bean & Green Bean Soup with Potatoes, and a company-worthy ragout of Shiitake Mushrooms, Butter Beans & Southern Greens served over cheese grits. In addition to cooking, developing recipes, and writing about food, Crescent presents regularly at the International Association of Culinary Professionals, and is a frequent speaker at schools, universities, and libraries. She blogs about food (Deep Feast), and you can find her on Instagram and Facebook. And if you ever wonder what she’s eating, just Google #dinnerwithdragonwagon.